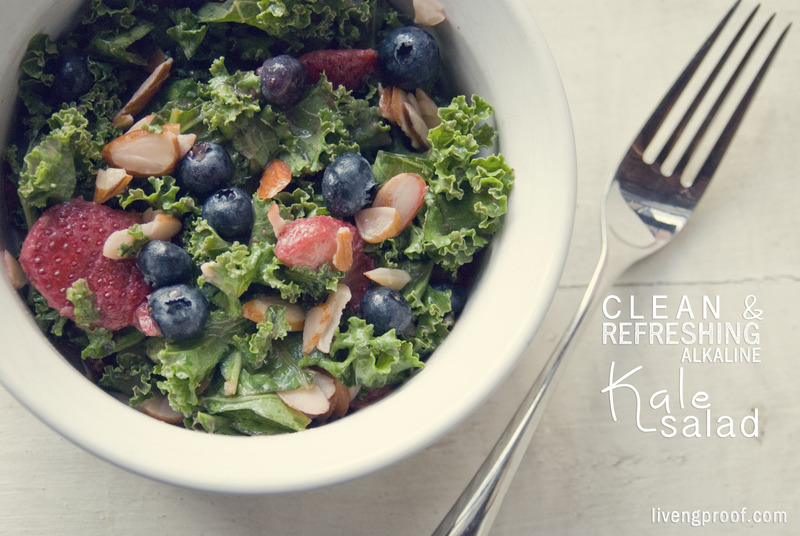 If you’re into living a healthy lifestyle chances are you’re also into kale. 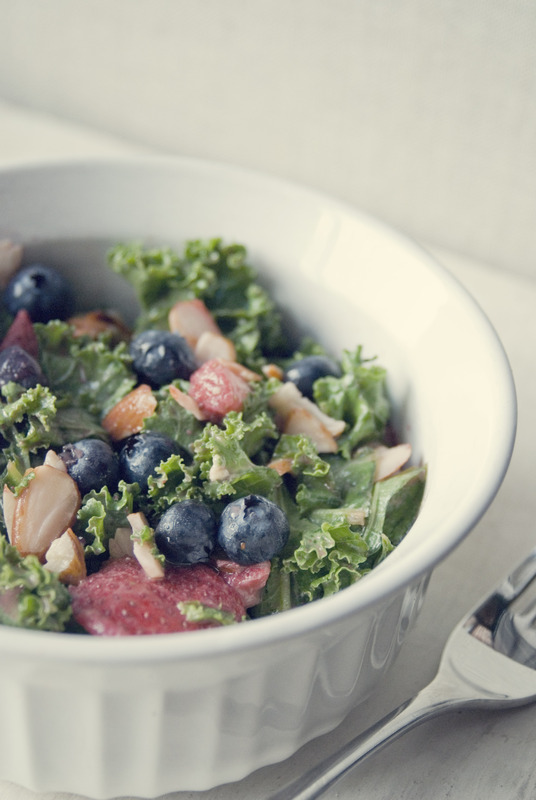 I’ve been on a kale salad kick recently… I seriously just can’t get enough of this particular dish. I love experimenting and discovering new ways to eat this superfood, which is actually how I invented this salad (ok – invented is a bit of a stretch but just go with me here). I was looking for a new salad dressing and came across one that sounded appetizing but I didn’t actually have all the ingredients listed on hand (I always use recipes as suggestions anyway) so I did what any of us would do, threw together my own version. Now, I’m no Julia Child, but I’d go as far to say that I think she’d even be pleased with this result. 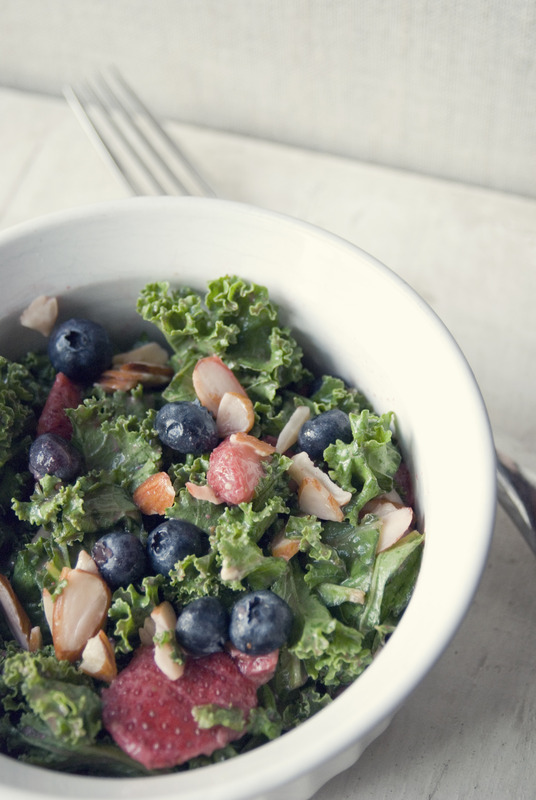 I also love kale in sautés, salads, wraps, soups, chips, smoothies, and juices! I’m a huge fan of how versatile this particular dark leafy green is; from savory marinades and homemade sauces, to sweeter tangier flavors like this salad…you just can’t go wrong! Regular intake of kale has been shown to stimulate antibody production, boost anti-oxidative capacity, drastically lower bad (LDL) cholesterol, and increase good (HDL) cholesterol!1 Seriously what’s not to love about this food! It belongs to the family Brassica oleracea, which includes brussels sprouts, collard greens, and cauliflower to name a few! My actual salad varies with whatever I have on hand! But you need something sweet to balance out the savory and I find that either red grapes or ripe strawberries really do the trick! I throw all the ingredients into a big zip lock and shake it to distribute the dressing evenly! Top with grilled chicken breast, or your choice of protein, or enjoy all on its own! I like to also add a dollop of pine nut hummus into the mix! The Scoop on Artificial Sweeteners! Liveng Proof ♡ Nutrition Tips!